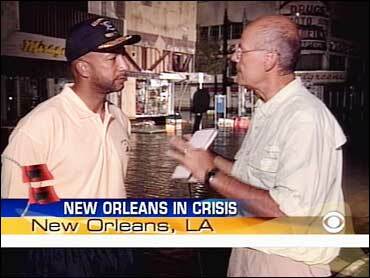 Even as New Orleans Mayor Ray Nagin mentioned estimates that Hurricane Katrina's death toll in his city could reach 10,000, he predicted that the Big Easy will recover. He added that fears of toxic waste winding up in floodwaters may be starting to materialize. The Early Show co-anchor Harry Smith that he thinks there will be thousands of deaths in New Orleans, adding, "Some computer models say 10,000. I don't know what the number is. But it's going to be big. And it's going to shock the nation." Still, Nagin says the Big Easy will come back. "The city is unique in its structure, its history," he said. "But it's unique, more importantly, because of the people. And the people are ready to come back. As a matter of fact, some of the last extractions we're doing, people don't want to leave. They're saying. 'We're not giving up on our city.' This city will recover. And it will be a better, new New Orleans." Nagin says it may take the city about three months to get running again. "Probably three weeks to clear the water, another couple of weeks to clear the debris, and six to eight weeks to get the electricity going," Nagin said. "The next immediate step is continued rescue missions. Seek and rescue, and then start to extract dead bodies." Nagin also said that water samples may have signs of toxic waste. "We've taken some water samples. The water colorations are changing dramatically," he said. "I think there's some toxic waste in there, or something going on. And we're going to figure that out and continue to drain, and make this city safer." He was a bit conciliatory when asked who shoulders the blame for the slow response to his city's desperate situation. "You know, I think we all do," he said. "I think this is America and, you know, what happened here should never, ever happen again in this country. And I think we ought to do some analysis, and not just play the blame game. But let's do some analysis and fix this because too many people suffered both during the storm, but way too many suffered after. And they suffered and they died. And it didn't have to happen. "It's much bigger than any one person, two people or whatever. It's a process issue. It's a legal issue. It's regulatory. The laws and the way we do things have evolved over time. And this type of catastrophic event requires quick action, and the bureaucracy did not allow that to happen."